One of these, Hōkūʻula (red star,) played a prominent role in battles between warring leadership from the islands of Maui and Hawaiʻi. This story dates back to about the mid-1600s. To put this timeframe in global perspective, around this time: the Ming Dynasty in China ended and the Manchus came into power and established the Qing dynasty; the Taj Mahal was completed in India: British restored the monarchy and Charles II was crowned king of England; and the Massachusetts Bay colony was forming after the recent landing of the Pilgrims at Plymouth Rock. Kamalālāwalu (Kama) met him and welcomed him royally. The chiefly host and guest spent much time in surfing, a sport that was enjoyed by all. Lono was lavishly entertained by Kamalālāwalu. Not long after Lono’s departure and return to Hawai‘i, however, Kamalālāwalu, driven by ambition, decided to invade and conquer the nation of Island of Hawai‘i. He sent spies to survey the opposition; they reported there were few men in the Kohala region. When Kamalālāwalu heard the report of his spies, he was eager to stir his warriors to make war on Hawaiʻi. Most of the prophets and seers supported the chief’s desire and gave dogs as their omen of victory [said that clouds taking the form of dogs foretold victory]. The dogs were a sign of fierceness, and so would the chief fiercely attack the enemy and gain the victory with great slaughter of the foe. Kamalālāwalu’s fleet landed in Puakō and met no opposition. Lono’s oldest brother, Kanaloakuaʻana, was in residence Waimea at the time, and, upon hearing of the invasion, marched toward Puakō with what forces he had at hand. A battle ensued at Kauna‘oa (near the present-day Mauna Kea Resort), and Kanaloakuaʻana’s forces were defeated, with Kanaloakuaʻana himself being taken prisoner and eventually killed. After this initial success, Kamalālāwalu and his Maui warriors marched boldly inland and took up a position above Waimea on top of the puʻu called Hōkūʻula and awaited Lono’s forces. During the night, Lono’s warriors from Kona arrived and occupied a position near Puʻupā (the large cinder cone makai of the Waimea-Kohala Airport.) His warriors from Kaʻū (led by its high chief and Lono’s half-brother, Pupuakea) and Puna were stationed from the pu‘u called Holoholoku (the large cinder cone out in the plains below Mauna Kea,) those from Hilo and Hāmākua were stationed near Mahiki, and those from Kohala were stationed on the slopes of Momoualoa. That morning, from his position atop Hōkūʻula, Kamalālāwalu could see that the lowlands were literally covered with the countless warriors of Lono, and realized that he was outnumbered. For three days the armies skirmished, with the actions of the Maui warriors being dominated by Kamalālāwalu’s nephew and chief, Makakuikalani. While Kamakau notes Kamalālāwalu died on the grassy plain of Puakō, other tradition suggests that after Lonoikamakahiki defeated Kamalālāwalu at Hōkūʻula, he brought the vanquished king of Maui to Keʻekū Heiau in Kahaluʻu and offered him as a sacrifice. The spirits of Kamalālāwalu’s grieving dogs, Kauakahiʻokaʻoka (a white dog) and Kapapako (a black dog,) are said to continue to guard this site. Outside the entrance to the heiau and towards the southwest are a number of petroglyphs on the pāhoehoe. One of them is said to represent Kamalālāwalu. So ended the first of the major wars between the nations of Maui and Hawai‘i, and a turning point in the history of Hawai‘i. The image shows Puʻu Hōkūʻula; in addition, I have added other images in a folder of like name in the Photos section on my Facebook and Google+ pages. Hanami (Japanese, literally, hana = flower and mi = look … “flower viewing”) is the Japanese traditional custom of enjoying the beauty of flowers; “flower” in this case almost always means cherry blossoms. In Japan, the flowering cherry tree, or “Sakura,” is an exalted flowering plant. On the continent, the plantings of cherry blossom trees originated in 1912, as a gift of friendship to the People of the United States from the People of Japan. Over three-thousand cherry blossom trees were planted along the Tidal Basin of the reclaimed Potomac waterfront in Washington, DC. Today, the National Cherry Blossom Festival is a DC spring celebration. Cherry blossom trees are very temperamental. They grow in cold climates and require a lot of sunshine, space, rain and breeze. The flowers bloom when a cold spell is followed by a warm spell. The cherry trees in Waimea are in rows fronting Church Row Park. The first trees (there were initially only three) were planted in 1953 in honor of Fred Makino. These trees are the Formosan cherry trees from Taiwan, which produce flowers but no fruit. In 1912, Fred Makino founded and edited the Japanese language newspaper Hawaii Hochi, which flourished through the Great Depression, two World Wars, dock strikes and political changes. After Makino’s death in 1953, his wife decided to plant cherry trees in his memory. From these, Parker Ranch gardener Isami Ishihara later propagated more trees. Ishihara then approached Pachin Onodera of the Waimea Lions Club to suggest the trees be used to promote community beautification. In 1972, led by President Frank Fuchino, the Waimea Lions Club started what was to become a cherry tree park at the County-owned Church Row by planting 20-trees donated by Ishihara. 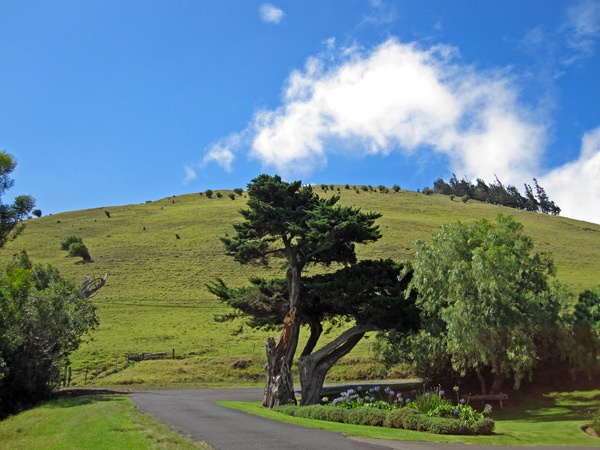 In 1975, 50-more trees were added in a tree planting commemorating the visit of Emperor Hirohito and Empress Nagako to Hawaiʻi and to honor the first Japanese immigrants who settled in Waimea. For two decades, Waimea’s free community festival has showcased the 60-year-old cherry trees planted at Waimea’s historic Church Row Park. 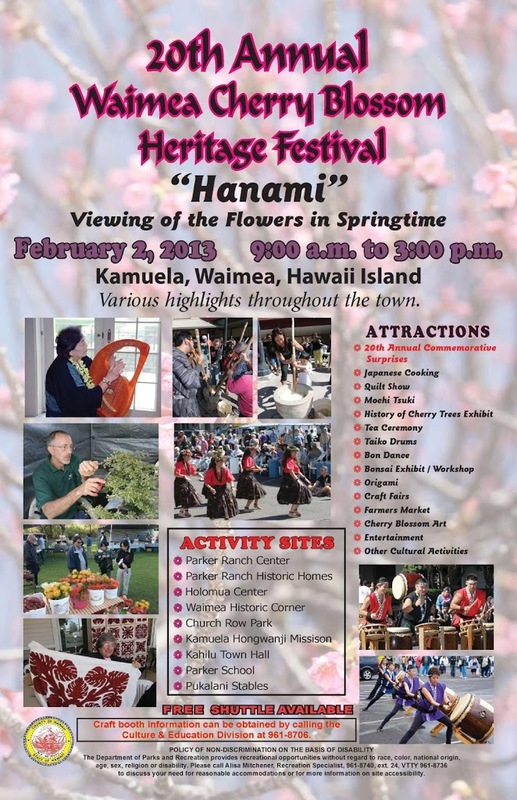 The event also celebrates this community’s rich Japanese cultural heritage and traditions at venues throughout town. Look for pink banners identifying sites — from the Parker Ranch Historic Homes on Māmalahoa to the Hawaiian Homestead Farmer’s Market. Everyone is invited to spend the day enjoying a lineup of Japanese and multi-cultural performing arts, plus hands-on demonstrations of bonsai, origami, traditional tea ceremony, mochi pounding and a host of colorful craft fairs and delicious foods. Festivities begin at 9 am in the parking lot behind Parker Ranch Center with special guests, honorees and performances, including bon dancing. Highlights this year will be an anniversary exhibit honoring some of the festival’s first performers and commemorating its founders – most notably the memory of the late Anne Field-Gomes, whose volunteerism benefited many Waimea organizations and events, including the festival. Anne Field-Gomes died October 23, 2012 at the age of 84. She brought the AARP’s Tax Aid program to Waimea, served on the Waimea Community Association Board, and was treasurer for the Friends of Thelma Parker Library and the South Kohala Traffic Safety Committee. She was a member of the Waimea Outdoor Circle, St. James’ Church and Imiola Congregational Church and the Waimea Pupule Papale Red Hat Club. The image is this year’s event poster. In addition, I have added other related images in a folder of like name in the Photos section on my Facebook and Google+ pages. Originally an Army camp named Camp Waimea, when the population in town was about 400, it became the largest Marine training facility in the Pacific following the battle of Tarawa. Camp Tarawa trained over 50,000 servicemen between 1942 and 1945 in the community of Waimea, South Kohala, Hawaiʻi. There were three ways to get to Camp Tarawa – by narrow-gage sugarcane freight train; by hard-axle truck or on foot. The 3rd Marine Corps built a small airstrip near town, consisting of a graded and oiled airstrip 3,000-feet long on land belonging to Parker Ranch. This facility was known as Bordelon Field. The field was named for William James Bordelon (December 25, 1920 – November 20, 1943), a US Marine who was killed in action while he led the assault on the enemy and rescued fellow Marines during the Battle of Tarawa. He was posthumously awarded the Medal of Honor. 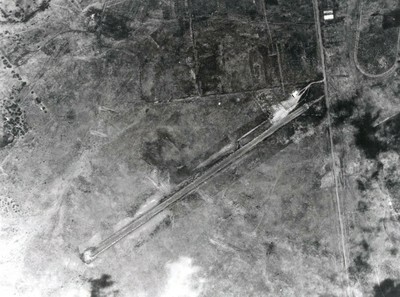 Following the war, the field was renamed Kamuela Airport. In 1947, funds were appropriated for the development of this field to meet scheduled airline operations using DC-3 aircraft. The strip was successfully used by non-scheduled operators flying small planes and also, on several occasions, by DC-3s, but the strip was hazardous for DC-3 operations. The community wanted a satisfactory airport in this area, not only for the convenience of the travelling public, but for the transportation of produce from this area to the Honolulu market. Extensive studies were conducted with regard to the further development of lands for increased production of farm commodities and if the community were assured of prompt delivery of its goods to the local markets, the air freight carriers alone would be the major users of this field. However, in 1950 Kamuela Airport was deemed unsuitable for development as a modern airport. Studies of terrain and weather were conducted to find a suitable site for a new Kamuela Airport. On January 28, 1952, the construction of the new Kamuela Airport was awarded to Hawaiian Dredging Company; the new airport was just across the highway from the old one. The landing strip was to be 5,200 feet by 100 feet. It was foreseen that the new airport would aid the development of the agricultural industry in Hawaii. Air freight traffic at the old Kamuela was sizeable. The field would be served by scheduled airlines, non-scheduled passenger airlines and freight air carriers. The new Kamuela Airport runway was completed in April 1953; the old Kamuela Airport (Bordelon Field) was inactivated in August 1953. In May 1953, Hawaiian Airlines began DC-3 cargo operations at the new airport and on July 1, 1953 it started scheduled passenger service, three times a week. The terminal featured a ranch house design and was the first of a combination passenger-freight structure in the island. This airport was completed entirely with Territorial funds without Federal Aid. The Island of Hawaiʻi’s County Council adopted Waimea as the official name for the area in which the airport was located. A 1969 legislative resolution requested that the airport be designated as Waimea-Kohala Airport to prevent confusion with Waimea, Kauaʻi. Shunichi Kimura, Mayor of Hawaiʻi County, hearing the desires of the County Council and residents around Kamuela, asked that the name of the airport be changed from Kamuela Airport to Waimea-Kohala Airport. This was approved by Governor John Burns. On October 1, 1970 Waimea-Kohala Airport was placed under the control of a new position in the State Airports Division, the North Hawaii District Superintendent. An innovative project in 1975 installed a wind-driven generator to power obstruction lights; previously, power had been provided by acetylene and later by storage batteries, all of which required continual maintenance. The wind-driven generator that powered the obstruction lights resulted in a substantial savings in operating costs. By 1976 there was a 24 percent drop in passengers at the airport. This was due to the completion of the new highway connecting the airport to the visitor destinations in the vicinity of Waimea-Kohala Airport and the more frequent scheduling of flights into Keāhole Airport. In 1978 the airport was designated as an eligible point to receive Essential Air Service (EAS) under the Airline Deregulation Act of 1978. On October 1, 1979 the Civil Aeronautics Board Order 79-10-3, the Bureau of Domestic Aviation, defined essential air service for Kamuela as a minimum of two daily round trip flights to Honolulu or Hilo and Kahului providing a total of at least 62 seats in each direction per day. In May 1986, Princeville Airways (predecessor of Aloha Island Air now known as Island Air, Inc.) initiated regular scheduled service to Kamuela Airport. Today, there is no scheduled passenger service at the Waimea-Kohala Airport, after several attempts of other airlines to offer passenger service. The image shows the initial “Kamuela Airport” (Bordelon Field;) in addition, I have added some other related images in a folder of like name in the Photos section on my Facebook and Google+ pages.